The global antiseptic and disinfectant market was valued at US$ 6.3 Bn in 2017. It is projected to expand at a compound annual growth rate (CAGR) of 6.2% from 2018 to 2026, according to a new report published by Transparency Market Research (TMR) titled “Antiseptic and Disinfectant Market Global Industry Analysis, Size, Share, Growth, Trends, and Forecast, 2018–2026”. 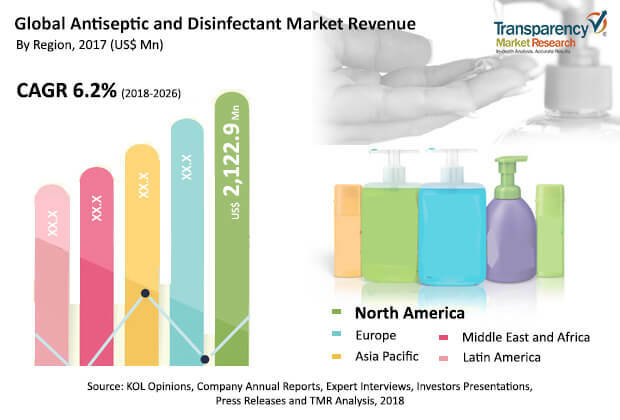 The report suggests that rising awareness regarding home cleanliness and the need for disinfection and rising concern regarding healthcare-acquired infections is expected to boost the antiseptic and disinfectant market in the near future. North America and Europe are projected to dominate the global market owing to increase in demand for efficient and effective management of antiseptic and disinfectant and the high rate of adoption of antiseptic and disinfectant for treatment planning by doctors as well as patients. The market in Asia Pacific is projected to witness expansion at a significant growth rate during the forecast period. Expansion of the market in Asia Pacific is attributed to the large base of private clinics and hospitals, rising geriatric population requiring hospital services after surgery, and increasing adoption of antiseptics for wound care therapy. The market for antiseptic and disinfectant in Latin America is likely to expand at a moderate growth rate during the forecast period. The global antiseptic and disinfectant market is projected to be potentially driven by the value added features offered by various antiseptic and disinfectant manufacturing companies in order to streamline the day-to-day work flow in treating the patients and increase the revenue of the practices. The antiseptic and disinfectant manufacturing companies provide a wide range of features and benefits from patient pain heeling remedies to treatment procedures, which can be utilized by physicians and hospital staff to treat patients. These features help physicians and nurses to streamline the wound care treatment activity required for patients in order to maintain their daily workflow efficiently and effectively. The key players offering the antiseptic and disinfectant are developing value added features such as effective surgical units with disinfectant sprayer, molecular modeling of proteins and enzymes, thereby reducing the overall chances of infection and thus, improving the overall effectiveness and efficiency of medical or surgery practices. Companies are focusing on the development of combined therapy facilities in their systems in order to effectively integrate the therapy or treatment procedure along with the formulation of antiseptics & drugs, and patient education & awareness programs. These value added features save the operational time of physicians and help improve the performance of the healthcare provider. Traditionally, hydrogen peroxide-based antiseptics and disinfectants were commonly utilized in wound therapy and other disinfectant constituents. Hydrogen peroxide products possess a greater activity against gram-positive than gram-negative bacteria. Hydrogen peroxide is widely employed as a biocide for disinfection, sterilization, and antisepsis and is commercially available in a variety of concentrations, ranging from 3% to 90%. Furthermore, these hydrogen peroxide based antiseptics and disinfectants are priced on perpetual license model and are moderately priced. Hydrogen peroxide products enable the user to practice low frequency clinical applications, allow the healing of extreme pain due to infection, and assurance of 90% recovery features by physicians are likely to propel the segment during forecast period. These hydrogen peroxide-based products address specific challenges faced during the treatment procedure due to the presence of catalase or other peroxidases in the organisms, which can increase tolerance in the presence of lower concentrations of hydrogen peroxide. Hydrogen peroxide-based products facilitate results in antisepsis and increase the level of disinfection & sterilization strength along with a combination of other chemicals. In terms of end-user, the healthcare providers segment accounted for leading share of the global antiseptic and disinfectant market. It is estimated to gain market share by the end of 2026, expanding at a CAGR more than 6% during the forecast period. Expansion of the life sciences industry, hospitals, and pharmaceutical industry, etc. has led to the prominent share held by the healthcare providers segment in the global antiseptic and disinfectant market. Increasing number of multinational hospital chains and high digitization budgets for sterilization techniques are likely to drive the healthcare providers segment during the forecast period. High prevalence and incidence rates of hospital acquired infection, expansion of the hospitality and hotel industry, public hygiene, etc. are likely to boost the commercial users segment between 2018 and 2026. Asia Pacific Offers Potential Business Development Opportunity. North America and Europe accounted for a key share of the global antiseptic and disinfectant market in 2016. These are likely to gain market share by the end of 2026. High adoption of digital platforms for sterilization technique, and government initiatives to promote the minimally invasive surgery techniques have contributed to leading share of these regions in the global antiseptic and disinfectant market. Asia Pacific is projected to be a highly attractive market for antiseptic and disinfectant, and is likely to exhibit a considerably high attractiveness index. The market in Asia Pacific is projected to expand at high CAGR of more than 7% during the forecast period due to a large number of clinics in emerging countries such as India, China, well-established healthcare facilities, and high adoption of digital healthcare technology in countries such as Japan, Australia & New Zealand, Malaysia, and Singapore. The market in Latin America is anticipated to expand at a moderate growth rate during the forecast period. The report also provide profiles of leading players operating in the global antiseptic and disinfectant market. 3M Company, Novartis Ag, Johnson & Johnson, STERIS plc, Getinge Group, and Cardinal Health are some of the leading players operating in the global antiseptic and disinfectant market and account for a significant market share. Companies operating in the antiseptic and disinfectant industry are focusing on increasing their geographic presence by means of strategic acquisition and collaboration with leading players in respective domains and geography. According to Thornton & Ross, it has merged with Genus Pharmaceuticals, which is expected to increase the company's OTC brand business in the near future. Other prominent players operating in the global antiseptic and disinfectant include Becton, Dickinson And Company, Whiteley Corporation, and Kimberly-Clark.